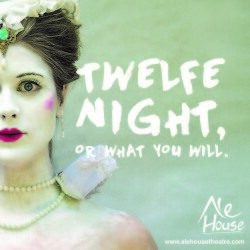 Did you miss seeing Ale House Theatre Co.’s Original Practices production of William Shakespeare’s Twelfe Night, or what you will during Toronto Fringe? Fear not, gentle theatre lovers! The company is doing one more, very special, performance at St. Vladimir Theatre on Thursday, July 16 at 8:00 p.m.
What’s so special about this performance, you ask? This time, the show will be Pay What You Decide. House Last Call: Free to enter; Leave what you will!” evening. Ale House Theatre Co.’s Twelfe Night, or what you will is directed by Joshua Stodart, and features a fine ensemble cast: Hilary McCormack, Tayves Fiddis, Dan Henkel, Mitchell Janiak, Peyton LeBarr, Tim MacLean, Andrea Massoud, Matt Shaw, Kyle Shields, Tal Shulman, Chris Whidden and Jake Vanderham. I saw the production last week during Toronto Fringe; here’s the write-up. So be of good cheer and get your butts out to St. Vladimir Theatre on Thursday, July 16 for a most delightful production of Twelfe Night, or what you will. In the meantime, give Ale House Theatre Co. a follow on Twitter to keep up with future productions.